The end of foreign correspondence? 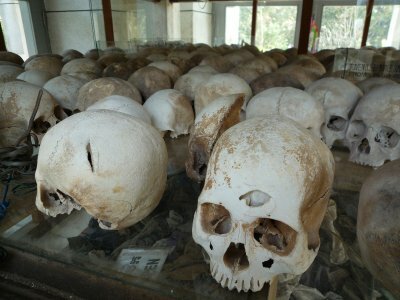 Is the role and relevance of the foreign correspondent now defunct or is it evolving? Foreign correspondence, I explained, is not as foreign as it used to be. “There, not here,” is over. It is a momentous, overlooked shift in the world: Foreign correspondents no longer cover one place for the exclusive benefit of readers somewhere else. In the Internet age, we cover each place for the benefit of all places, and the reported-on are among the most avid consumers of what we report. Read this particularly revealing and thought provoking story in the New York Times for a snapshot of how the web is really transforming journalism. In Old News is Good News, I covered the efforts of Google to digitise old newspaper archives. 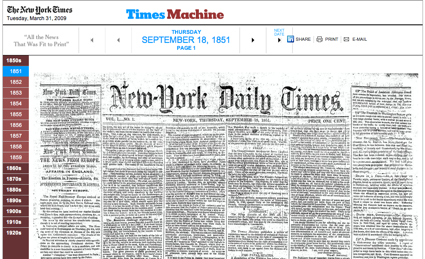 The New York Times has a comparable exercise in the form of its Times Machine, which contains 70 years of the NYT’s archives from its first issue on 18 September 1851 through to 30 December 1922. It’s just amazing. Even though the archives in paper form may well outlast the archives in digital form, digitising this information brings it to those of us who will never have the chance of reading or just seeing them otherwise. But can imagination and innovation take root unless we break free from the shackles of orthodoxy? For transformative change to happen, we will need to rethink certain aspects of our education, bureaucracy, social hierarchies and culture. Are we willing and able to attempt these? If as the President proclaims 2009 is the year of English and IT, he’ll be hard pressed to come up with answers to the challenges Nalaka poses and safeguard the legacy of Sir Arthur C Clarke by securing scientific inquiry that isn’t framed or undermined by nepotism, corruption and favouritism. Read Nalaka article in full here. The Index on Censorship Freedom of Expression awards honour those who have made outstanding contributions to the promoting of free expression. This year, the Sunday Leader is shortlisted for the Guardian Journalism Award. From the ICT4Peace Foundation came news today of its collaboration with Ushahidi. The ICT4Peace Foundation, Geneva has mandated Ushahidi to develop an ICT4Peace Crisis Information Management Platform Demonstrator (CIMD), based on Ushahidi’s existing platform with the following features and functionality. A product that is able to be deployed in the field with a minimum of fuss, on any browser, on mobile phones, over any Internet connection and also store data offline for later synchronization. A database architecture robust enough to meet the demands of information gathering in UN peacekeeping and humanitarian operations, based on requirements and necessary forms provided by the ICT4Peace Foundation. A front end that degrades gracefully on low bandwidth connections, with key information able to be consumed even on dial-up. An emphasis on accurate location data, which needs to include GPS co-ords based information and integration with UN OCHA’s location and mapping standards. The ICT4Peace Foundation will provide location data. Combined, Ushahidi’s thought leadership in the field of crowd sourced information gathering and the ICT4Peace Foundation’s expert input into the development of the tool, especially in verifying information in a manner that facilitates robust, accurate, timely analysis and information sharing in peacekeeping operations will make the CIMD a useful tool to augment crisis information management practices in the UN, and elsewhere. Add value to Ushahidi’s model of crowdsourcing by adding a module / component (call it what you will) of information verification. While Ushahidi has its own ideas in this regard, the Foundation’s initial intended audience will be more manageable, allowing for mechanisms – both technical and processual – to be built into the system that along with requisite training can significantly enhance information gathering and analysis in critical peacekeeping operations. I met David the extremely affable and unassuming David Kobia in New York recently. Our interactions were far too short, but his presentation on Ushahidi wowed an audience of seasoned UN staff and practitioners from NY, Rome and Geneva – never mind that so few of them could pronounce Ushahidi correctly (I heard Ushahi, Ushidi and Ushadi)! We also talked briefly about the joys and pitfalls of moderating websites within cycles of violence that explored conflict resolution – he with Mashada (an online African community) and I with Groundviews. Looking forward to blogging the development of this.